Beautiful blue roan with alot of early horn growth. Cute Ringman BCB daughter. These heifers are in big demand. Queen Enuff is a deep bodied, brindle heifer. Her dam is one of Brent's favorite Ringman daughters. 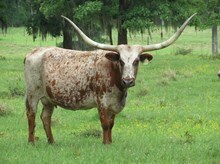 Her sire is a brindle son out of the beautiful, twisty horned cow BL Safari Sue. A great cross of Woking Man Chex and Bandera Chex! 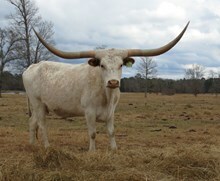 Big Bodied cow with a ton of horn. Well put together young cow with great genetics. A lot of total horn and big base on this PPF Gunmaker daughter. 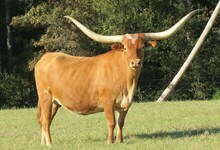 Big cow that raises some good calves. Beautiful tri-colored cow with a Bomber Chex HEIFER at side. Her last Bomber Chex heifer owned by Tom Smith is a knockout! Great cross of Working Man Chex and Bandera Chex which brings in Working Woman, Coach, Poco Lady BL. 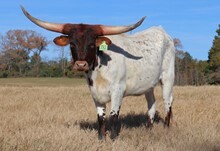 Gorgeous tri-colored Rio Grande daughter with over 99" total horn. 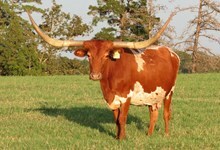 Over 97" total horn with big bases. 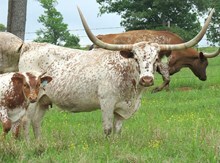 Beautiful cow out of Nancy Dunn's great herd. Bred to Bomber Chex 80! 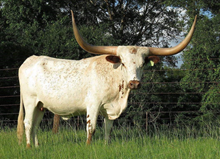 Beautiful cow out of El Coyote's most proven and predictable female lines! She is a proven producer. Beautiful brindle cow out of Watson 167, used by the Bolens. She has produced some great offspring. Beautiful flea-bitten color cow that produces very well! 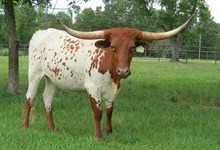 Beautiful cow out of Working Man Chex and Watson 167. 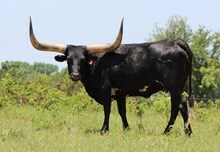 Two bulls that have really produced for the Bolens! 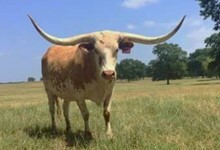 Great producing total horn cow! 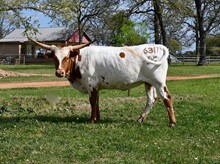 Hudson Longhorns has 2 great heifers out of this cow! Great milking cow with a beautiful face. She has produced some really nice heifers.